I got 2 chaises & they were not hard to put together although I did need to use a rubber mallet to get one set of legs in. The legs on that one didn't line up perfectly but nobody will ever notice. I put them out & they are pretty and sturdy/stable. The fold perfectly flat which is great. This user was entered into a sweepstakes after submitting their honest review. Simple and elegant, this streamlined mesh-backed chaise offers the ultimate in comfort and support. 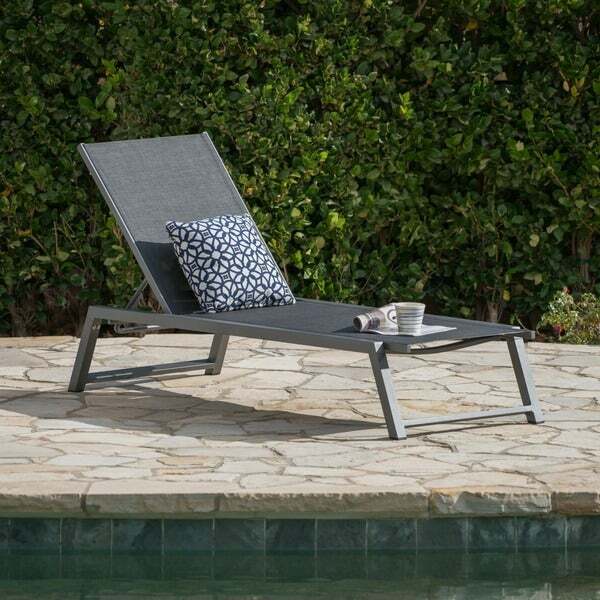 Fully adjustable and crafted from the highest quality materials, it is perfect piece for lounging poolside or on the patio. You will thank yourself for this purchase. Well constructed, easy to assemble chair. Comfortable. Nice, neutral color and simple lines for any taste. The Grey is more of a beige than a grey. I got 2 chaises & they were not hard to put together although I did need to use a rubber mallet to get one set of legs in. The legs on that one didn't line up perfectly but nobody will ever notice. I put them out & they are pretty and sturdy/stable. The fold perfectly flat which is great.